Ever had one of those recipes that held such happy memories that you just want to relive and reminisce that time of your life? Pineapple upside down cake is one of those for me. My grandmother used to make this cake for us all of the time. It was one of her specialties and it still is the best I’ve ever had. Since becoming gluten free, a lot of those recipes are forbidden, so it was one of my goals to recreate this special cake. And after scouring the internet for recipes and comparing different ones this is what I’ve come up with. 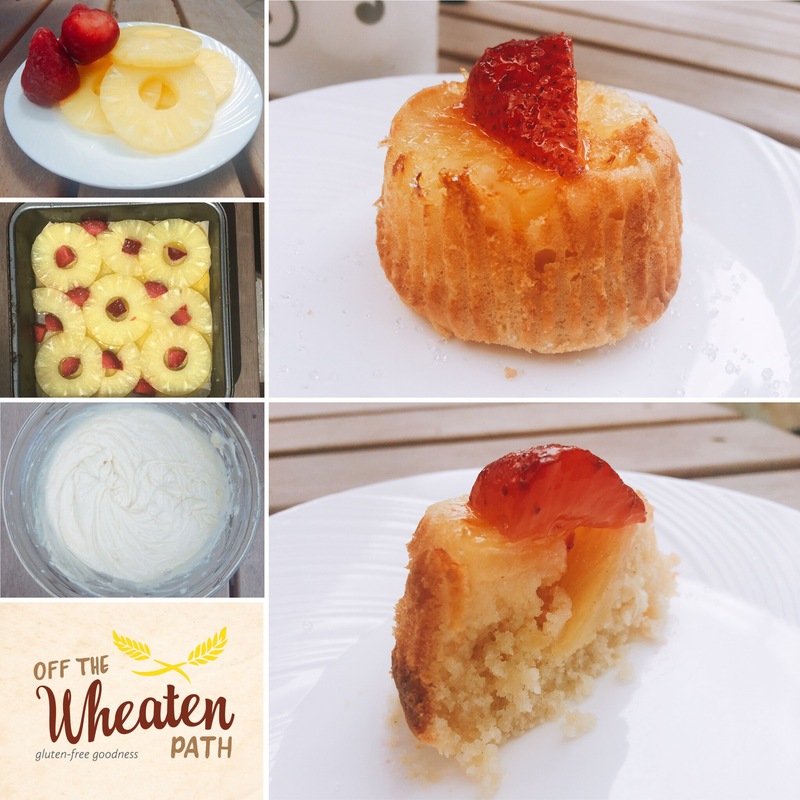 This version of pineapple upside down cake has no added sugar, no dairy, gluten-free and most of all 100% delicious. I hope you enjoy it as much as I do! ¼ cup pineapple juice reserved from the tin. 2. Line a square 8×8 cake pan with parchment paper. Grease the sides lightly with coconut oil. 4. Arrange the pineapple slices on the bottom of the pan. Place the strawberries in the open spaces until the entire bottom is covered. Set aside. 5. In a medium bowl, sift the flour, guar gum, baking soda, baking powder, and salt. Whisk until fully combines and set aside. 6. In another bowl, whisk together the coconut oil and xylitol until there are no lumps. Add the egg, mix again until combined then add the yogurt, vanilla, coconut milk and pineapple juice. 7. Add the dry ingredients to the wet and mix until the mixture is fully combined. 8. Pour batter over the pineapple spreading to make sure it’s evenly distributed. 9. Bake for 55 – 60 mins or until a toothpick comes out clean from the center. 10. Let stand in pan for about 10 mins before removing. Best served warm. NB. If the top is getting too brown and the center is still not finished baking, cover with a piece of foil until done. Adapted from What the Fork Food Blog.